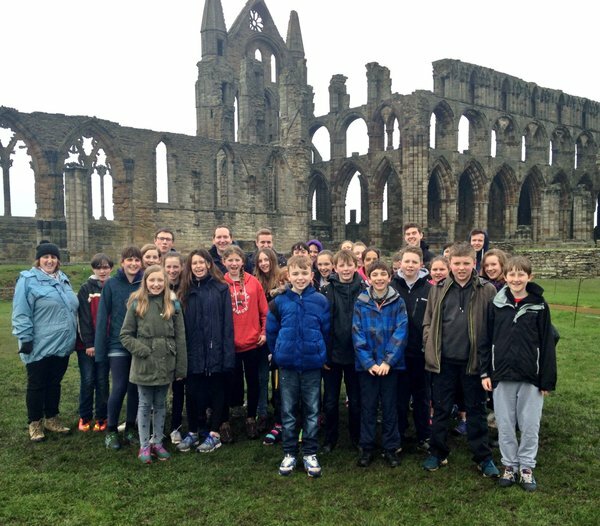 Year 7 students from Tadcaster Grammar School and Sherburn High School got a taste of sea air over the Easter holidays on a residential visit to the town of Whitby with the Partnership Development Team. The group stayed at Whitby Abbey House, a beautiful hostel situated right next to Whitby Abbey with centuries of history to discover inside. After a drizzly afternoon at the Abbey and a spooky ghost walk around St Mary’s Church (made infamous by Bram Stoker’s gothic novel Count Dracula), the group were glad to get back indoors for some warming hot chocolate and a ‘Viking Knitting’ activity with the group leaders. Crabbing in the harbour at Whitby. Both days were filled with activities, from crabbing in the harbour to searching for clues around the Abbey House itself. On the second day the weather was good enough to visit the seashore, where the group became very busy rock pooling, stone skimming, fossil hunting and even building a viking longboat out of sand! The afternoon was spent in a more relaxing fashion, painting pottery tiles at local company Doodle Pots. Exploring the shore for fossils and more. By the time the bus had arrived, everyone was worn out and ready for bed – especially the teachers! For more pictures and information on events and visits in the STAR Alliance, follow @Partnership_TGS on Twitter. STAR Alliance TLC Conference is a hit!